2012 SSQQ SLOW DANCE AND ROMANCE! Since you enjoy hearing about weddings among the dance community, I thought I would share our news! 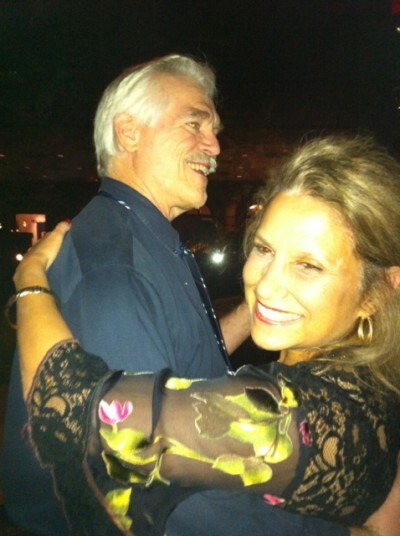 Bill and I met on the dance floor last August (Wild West) and got married May 6, 2012. Yes, have no fear, that old SSQQ Romance Magic lives on!! 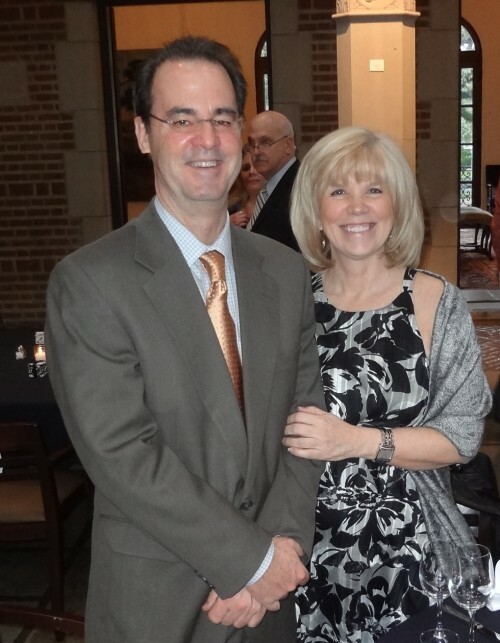 Ed Akin and Tracy Schweinle were married in lovely wedding ceremony held at the Rice University Chapel on Saturday, February 11. Out of respect for the solemnity of the occasion, I decided not to photograph the wedding. That said, I can at least report on my impressions. There were about 80 people in attendance. Unlike most weddings where I know just a few people, I would have to say 67% of the audience appeared to be SSQQ Lifetimers. 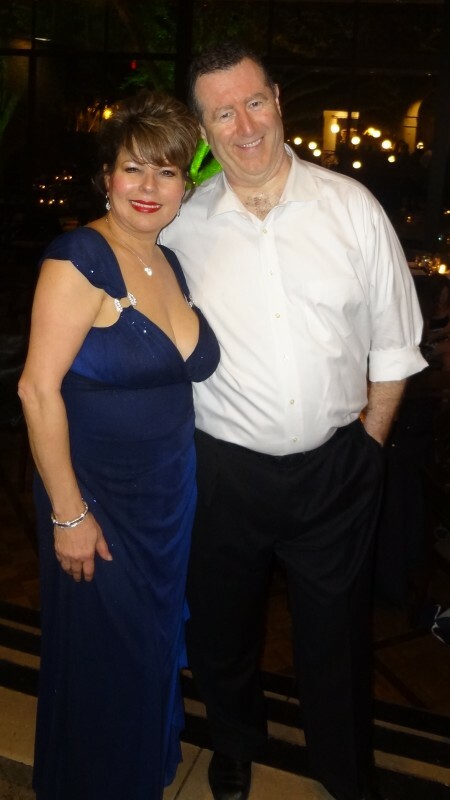 In particular, I saw so many people who were on our most recent SSQQ dance cruise over Labor Day 2011 that I thought I was having a flashback to Formal Night. I concluded that Ed and Tracy consider us to be part of their family. I held onto this sweet thought all night long because it made me very happy to think it. MG Anseman was the Best Man. Everyone agreed that MG looked very handsome and very distinguished up at the altar. Tracy has been MG's loyal assistant in dance class for so many years now I have lost count. MG announced later on at the reception that Ed and Tracy had actually met in his dance class. MG was very proud of his Matchmaker status. Having made similar claims over the years, I know that declaration made MG very happy. Here MG is pictured with his lovely wife Gay. I took MG and Gay's picture earlier in the evening. Unfortunately Gay panicked and squinted her eyes shut. Fortunately I took another picture at the end of the evening. What a difference two hours and several glasses of wine make. Here I would have to say that Gay appears, well, uh, quite gay indeed. MG looks pretty darn happy himself. As well he should. We all had a great evening together. 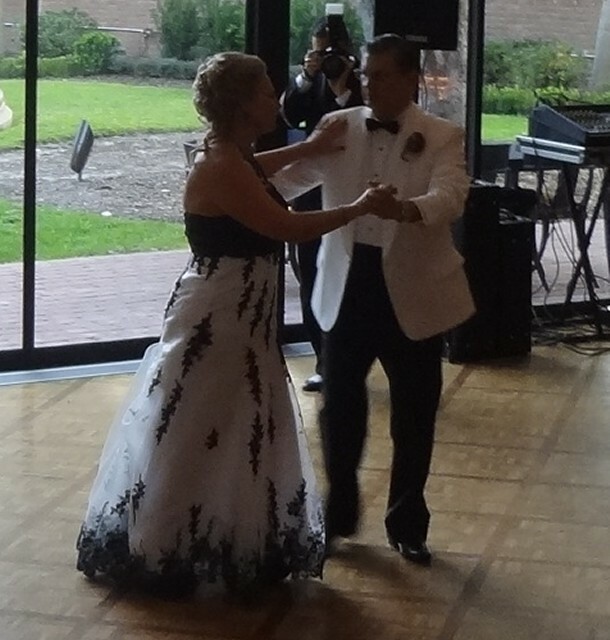 I recognized Al Domaque, the wedding official, from dance classes, but I do not know him very well. 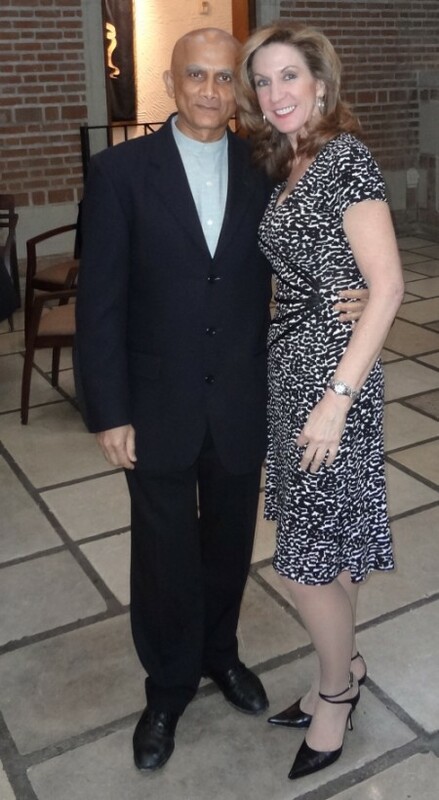 Here Al is pictured with Karen Eggert. You might wonder how I know everyone's last name so well. It's easy. Most of these people went on our last cruise. All I had to do was pull up the "Who Went" roster and rattle off the names. Then I found an even easier way - almost all these people were on George Sargent's Magic Bus Trip last year. See for yourself. Al took advantage of his position to give Ed, Tracy, and all of us in the audience some sound words of advice on love, marriage, and responsibility. However it was Al's small joke that brought down the house. Al commented that his sermon had managed to keep Tracy quiet for over 15 minutes, the longest spell of silence he had ever observed in all his years of friendship with this loquacious lady. 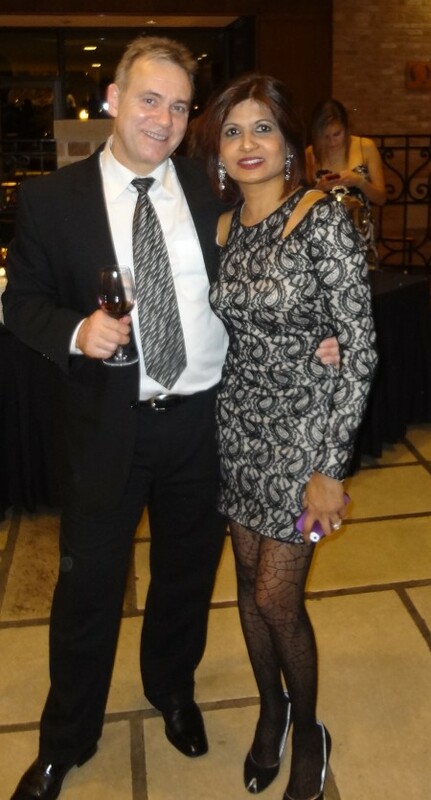 Jerry LaTour is pictured here with his wife Vickie, the former Vickie Bara. Jerry served as one of the ushers. Here is a neat coincidence. 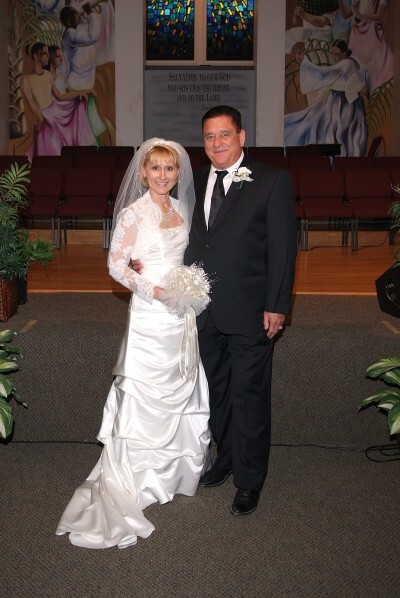 In relationship to today's wedding, Jerry and Vickie were married ten years earlier in February 2002. I happen to know this because I found their names on the SSQQ Wedding Hall of Fame list that includes all the many people who have met at SSQQ and gotten married. 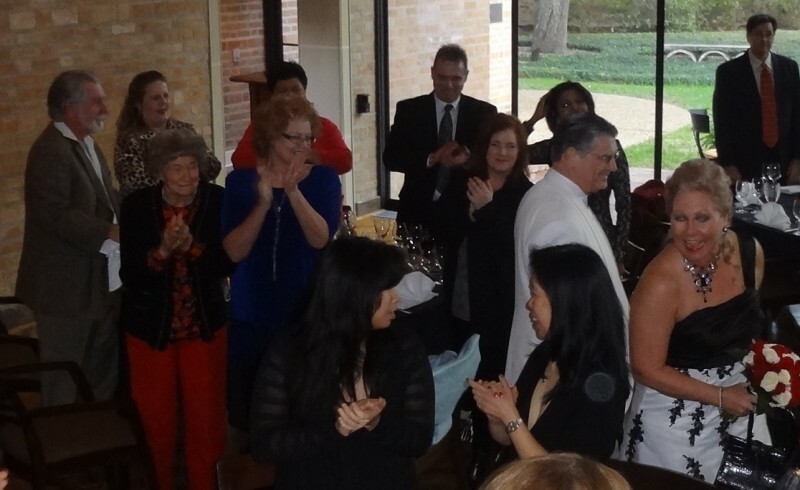 I never get tired of pointing out that SSQQ helped 250 couples get married during our final ten years of business. Yes, Jerry and Vickie were the happy victims of the SSQQ Cupid who is responsible for so many wonderful marriages. 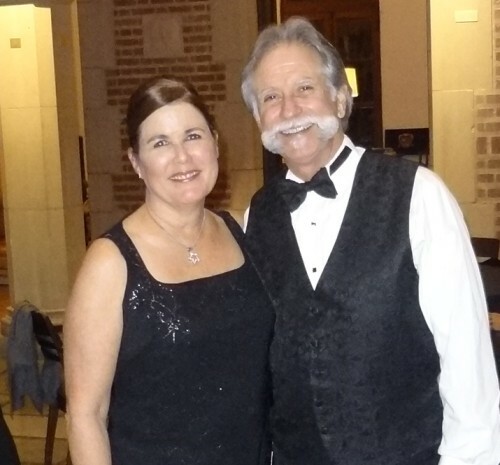 Jerry and Vickie were full-time members of the 2002 SSQQ Western Swing Graduating Class. 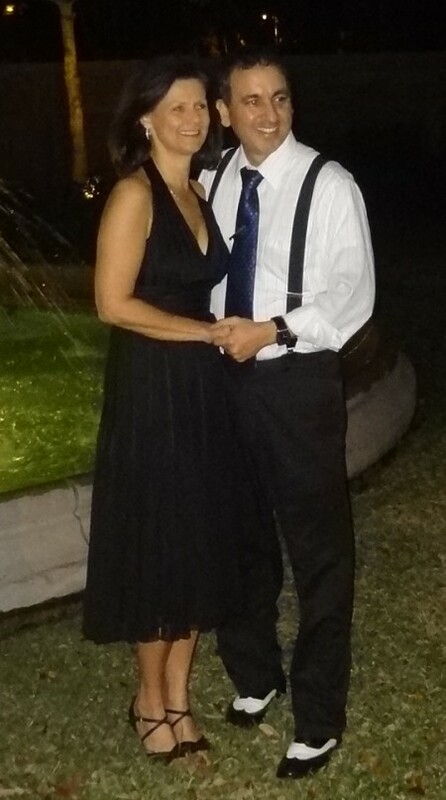 Manny Angulo is pictured here with his lovely wife Michelle. Like Jerry, Manny helped usher us into the wedding ceremony. Manny has something else in common with Jerry. Manny met his wife at SSQQ-Bissonnet as well. They married in 2008. I nicknamed the former Michelle Crossley "Spitfire" for her strong personality. You always knew when Michelle was in the room and I say this with complete respect. Michelle is a born attention getter. One anecdote about Michelle. She was one of the people stuck at SSQQ during Tropical Storm Allison back in 2001. Michelle is fearless. No flood was going to stop her from getting home. So Michelle got into her truck and headed into the night. Bad move. Michelle ended up spending the night in her truck at some gas station. But I don't think Michelle was that fazed. She and Manny look really happy together. By the way, Michelle told me she just finished the Greek Marathon. That would be the one in Greece. That is very impressive! Here are four members of an SSQQ Rogue Gallery. Call them the Blonde Bombshells. Talk about the Danger Zone. I was terrified to go anywhere near them. That's Sherry Thornton, Joanne Hatley, Mary (Don't Call me Coffee) Cioffi, and Wendy Weston. 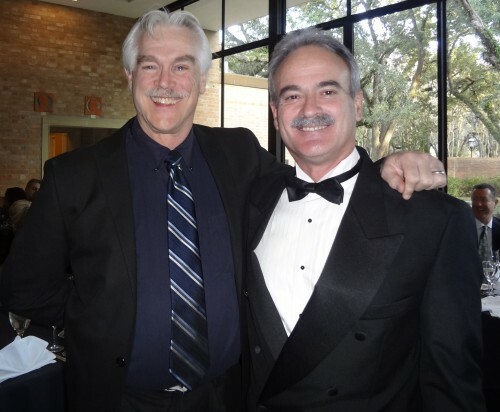 Here I am with my friend George Sargent. George and I go so far back that I can't even remember how far back we go. My first recorded memory of George came on the 2004 Mardi Gras. This is the cruise where George won all kinds of recognition. George was Rookie of the Cruise, Most Valuable Player on the Cruise, and Most Photographed Person on the Cruise. When I finished the cruise recap, I was astounded to discover George was in practically every single picture. I have never before seen anyone with such a homing instinct for cameras. That is how George acquired his well-deserved nickname 'Mr. Handsome'. As you can see, today George is just as Handsome as ever. I wanted to be photographed next to him because that way I was certain to appear in this story of Tracy and Ed's Wedding. I often forget to take my own picture. George has always been a riddle to me. For example, George waited until the last possible moment to sign up for last year's cruise. This year he was the first person to sign up. Too weird. Incidentally, George asked me to remind everyone that he wants all of you to sign up for his Magic Party Bus on our upcoming Magic 2012 trip. George quickly ditched me so he could have his picture taken with his pretty girlfriend Liana Waldberg. Liana has a nickname too - Welcome to the Jungle (or 'Jungle' for short). A few years back while doing a crossword puzzle, I learned that a "liana" is a jungle vine. 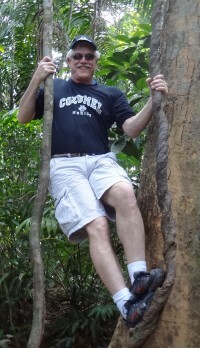 Sure enough, on my recent trip through a rainforest in Costa Rica, I was tickled when our guide pointed to two large vines and called them "lianas". Aha! So that's what they look like. One thing that made me laugh is that in real life Liana is almost as thin as these vines. In honor of my friend, I immediately had Marla snap my picture climbing an actual liana. 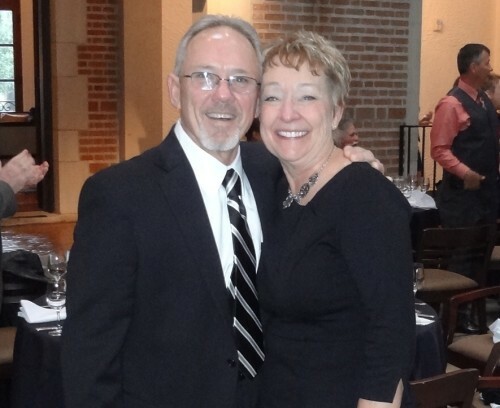 Here is a picture of Peggy McElroy with her friend Mark. Please forgive that I have forgotten Mark's last name. Mark took some West Coast Swing from me right before the studio closed in early 2010, then headed off to Asia to attend to business interests. That was two years ago and now Mark is back. So is Peggy's smile. Jim Colby and Marlane Kayfes go all the way back to 2001. They had just started to date when they got stuck at SSQQ during the same Allison storm that stranded Michelle Crossley in her truck. Trust me, Jim's gift was highly appreciated. Jim went on to dance greatness as a member of the world champion Heartbeat, an SSQQ dance team in the early 2000s that won many trophies in western dance team competitions. I have to say I loved Marlane's colorful combination. Here is a wonderful picture of Tracy and Ed as they enter the Reception. Before I forget, I want to apologize to all the people who came to the Reception that I did not get a photograph of. Leroy Ginzel as well as Betsy and Bob from very my own table were among my glaring omissions (Betsy and Bob can be seen in the background of Marlane and Jim's picture just above. Plus one picture of Betsy didn't come out). Joseph Maytum was another omission. I think he had to leave early. Nina Rutiaga, Ed Anderson, Jo Anne Armstrong and Judy Walsh are some other people who come to mind. Fortunately, you at least spot all four of them in the background of this picture of Tracy and Ed's Grand Entrance. I might add I forgot to get a picture of Marla and me together. So please forgive if I overlooked you. It was not intentional. Now let's take a look at Ed and Tracy's First Dance together. I must say, they got right to it. They entered the room and started to dance. They danced a Nightclub, but I regret I didn't recognize the song. 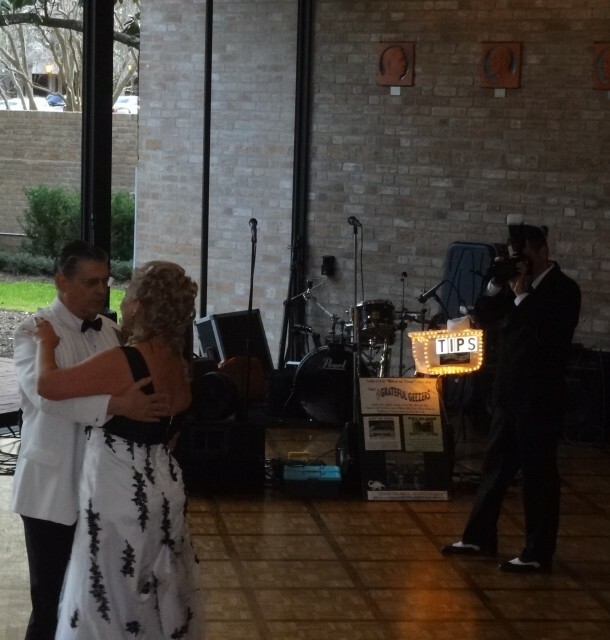 There can be no doubt that Steve Gabino's pictures of the First Dance will turn out to be far superior to my own dark shadows. However my blurry pictures do manage to convey two highly important impressions. First, Ed and Tracy danced a Nightclub beautifully. They were very graceful. Second, they appeared wonderfully happy together. We were all grinning in appreciation. We took the festivities outside for a while and got some great pictures for our efforts. On the left we have Vivian Gustafson and Steve Gabino. 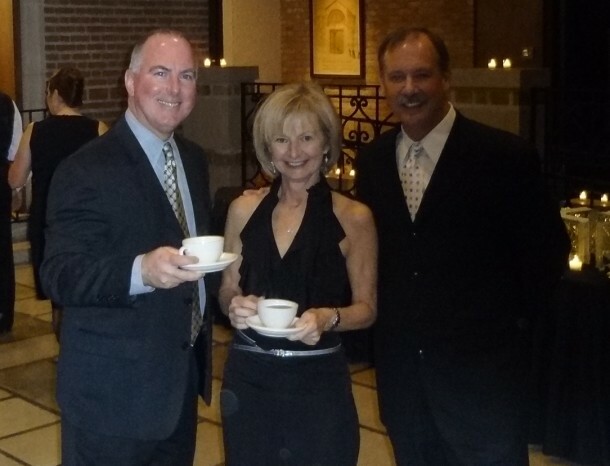 On the right we have Marsha Baxmann and Don Wicks. Very soon Don will be headed out to sea in March for his first cruise. Don and Marsharita are going to the Eastern Caribbean with our group. The two of them are very excited. They are counting down the minutes!! Marsharita was beaming throughout the night. She had a real glow about her. Iqbal Nagji and Barbara Majors on the left look wonderful together. 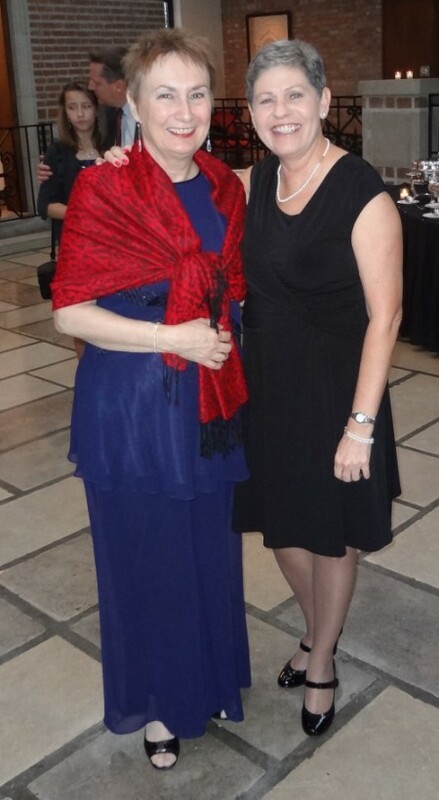 On the right, Marlane and Dee Medina took an equally delightful picture. I don't know the couple behind Marlane by name, but the gentleman was very nice to me. He reminded me that we met back in 2008. All in all, I think the pictures make it pretty clear that this was a happy crowd. It wasn't hard at all to get people to smile for the camera on this special occasion. 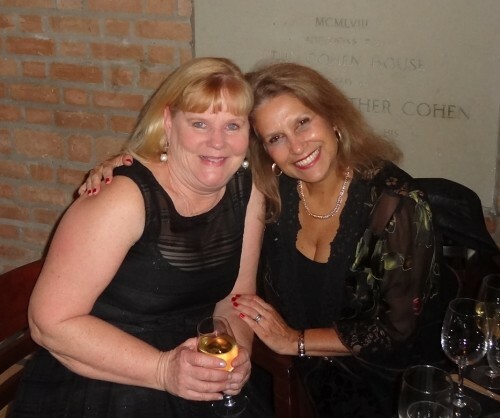 Marla and Fran Zandstra are really good friends. Can you tell? What a beautiful couple. This is Ray Wyatt and Mona Desdemona. Not everyone at the reception was from SSQQ. It just seemed that way. I apologize, but I do not know who these four people are. I know Tracy invited many of her friends from the hospital where she works to the Reception. 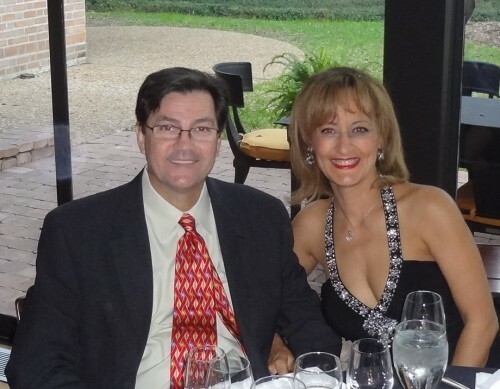 For that matter, Ed, a Professor of Computational and Applied Mathematics at Rice, surely invited some of his colleagues since the event was held at the Cohen House on the Rice Campus. I don't know Ed that well. Marla knows him better. Marla says he is quiet, extremely kind, and thoughtful. Her favorite word for Ed is "dignified". I agree. Ed is a little on the reserved side, but has a wonderful warmth about him. He seems very generous and giving. 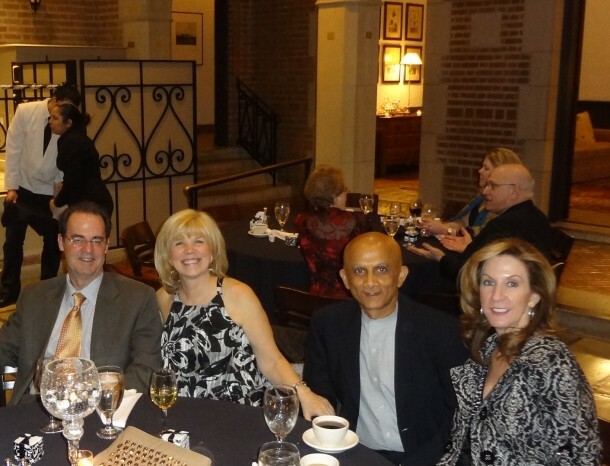 Marla and I had the honor of sharing a table with Gary and Cheryl Davis. I thought Gary looked unusually handsome... and I had not had a drop of wine at this point. There was definitely something very different about him. Then it dawned on me... this was the first time I had seen Gary without his Cowboy hat in ages. I cracked up. Gary cleans up pretty good, doesn't he? Gee whiz, I didn't even know he had hair! 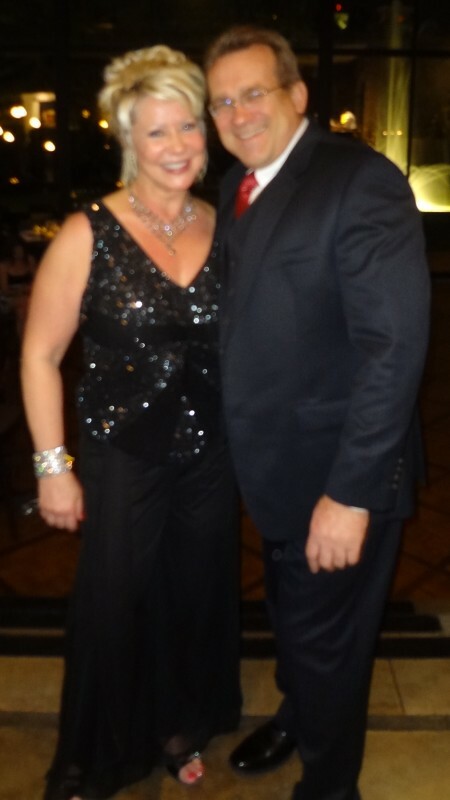 Gary and Cheryl are another couple who met at SSQQ. 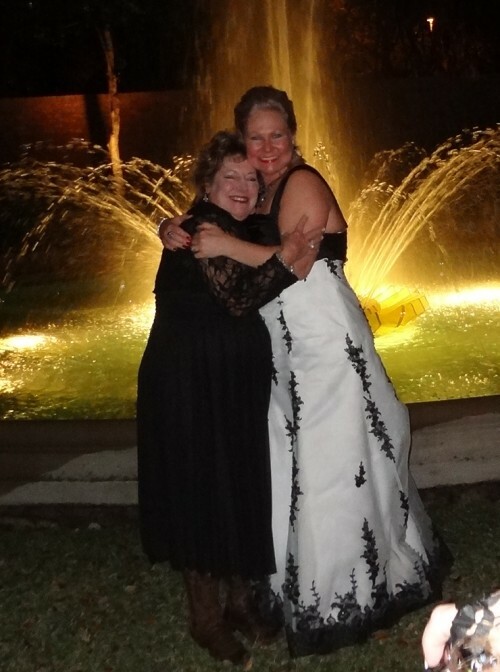 Marla and I had the honor of being at their wedding in July 2004. Not long after Gary married the former Cheryl Cormier, I had the pleasure of marrying Marla two months later in September. I just wish I could remember the exact date! I asked Cheryl to dance West Coast with me. Cheryl blanched. "I haven't danced West Coast in ages!" Hey, it's like riding a bicycle. It all came back quickly. Cheryl aced everything I threw at her. The girl's a pro on the dance floor! Gary and Cheryl teach western at SSQQ on Sundays at the same time as MG and Tracy. Here we have Rice University's answer to Rome's Trevi Fountain. 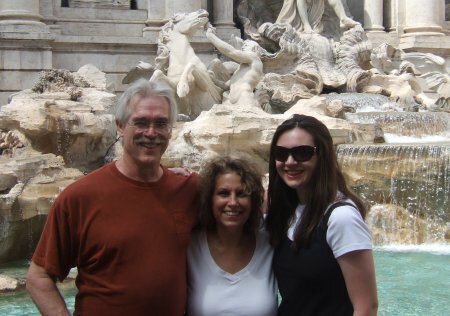 Marla, my daughter Sam and I saw the Trevi Fountain when we took a cruise to Italy and Greece in 2008 (Sam is now a Junior at UT). Having seen both fountains, I guess I have to give the nod to Trevi. Rice's fountain was quite impressive nonetheless. 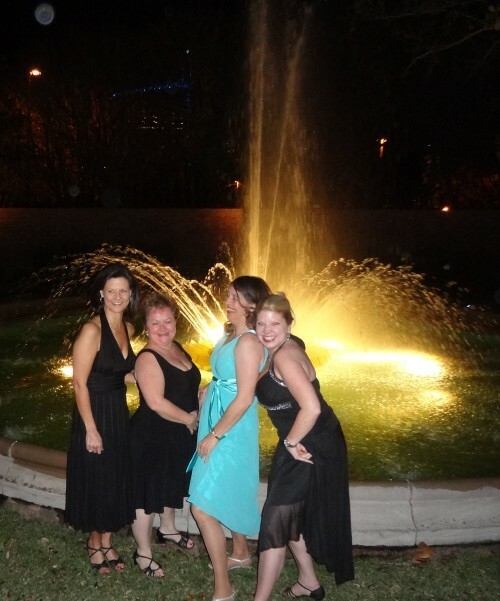 Not only was the Rice fountain very beautiful, so were the ladies. That is Ann Wells in blue and Kristi Wohfahrt joining Vivacious and Marsharita. Those girls were having a lot of fun. I could be wrong, but I got the distinct impression that one more glass of wine for each of them and this picture could have turned out even more interesting. Kristi and Anne definitely looked like they were ready to go swimming. On the left, thank goodness some people behaved with decorum. The quiet dignity of Ed and Tracy set the example we all needed. 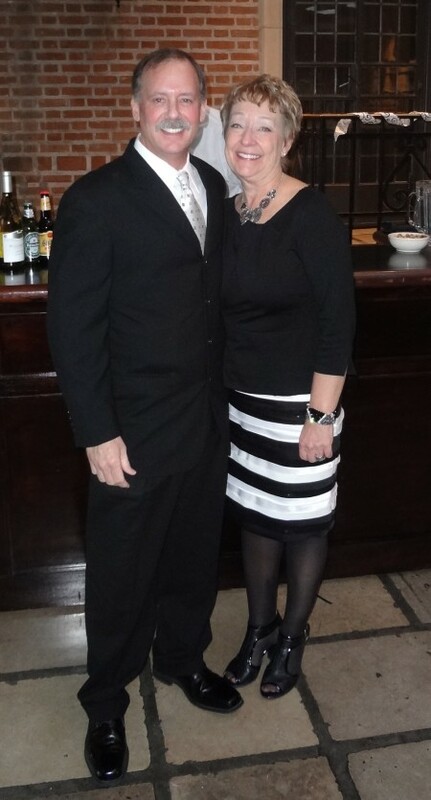 They helped the rest of us stay under control despite the generosity of an open bar. Many of us were feeling no pain towards the end of evening. Trust me, the pain returned the next day. Oh, did it ever!! 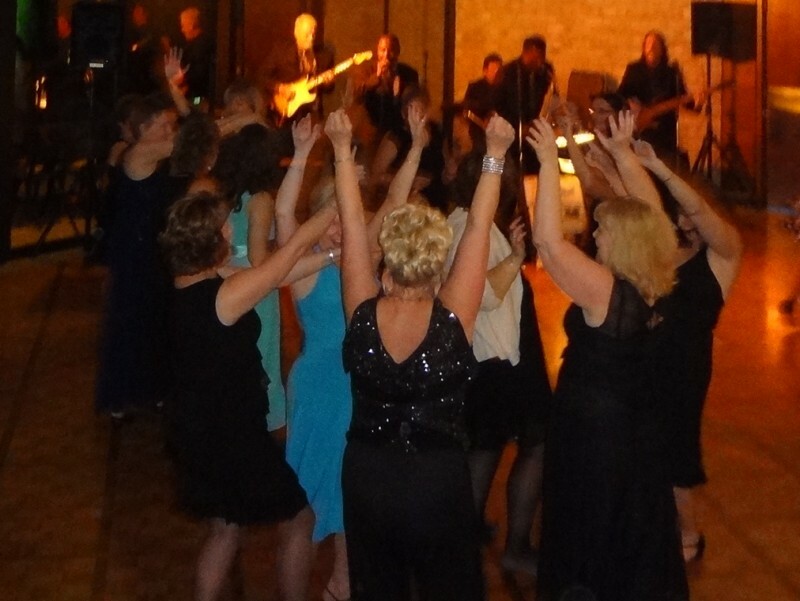 This Reception was like a credit card bill - have fun now, pay later with interest tacked on. On the right we have two ladies who work with Tracy. At the time, I had no idea the lady towering over Tracy was a nurse. I assumed she was a supermodel who had jetted in for the occasion. The young lady was the very definition of 'statuesque'. She was not only tall and beautiful, she was graceful and charming as well. 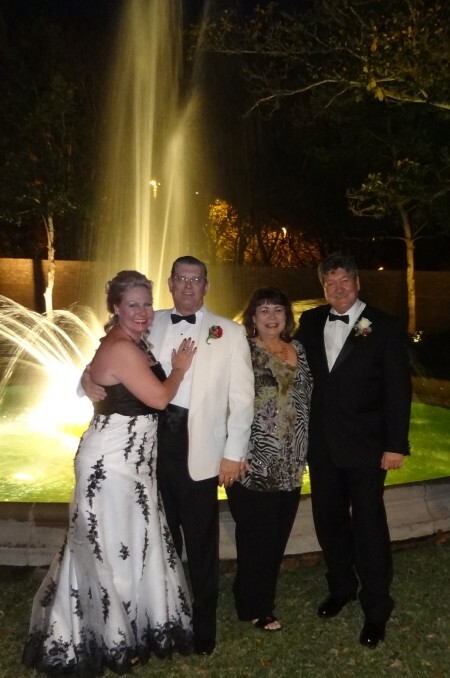 Marla was honored to be included in a family picture with Ed and Tracy. Those young men are Chris and Jeffrey Akin, Ed's sons. You don't suppose Ed is proud of his granddaughter? What a picture! Aha! 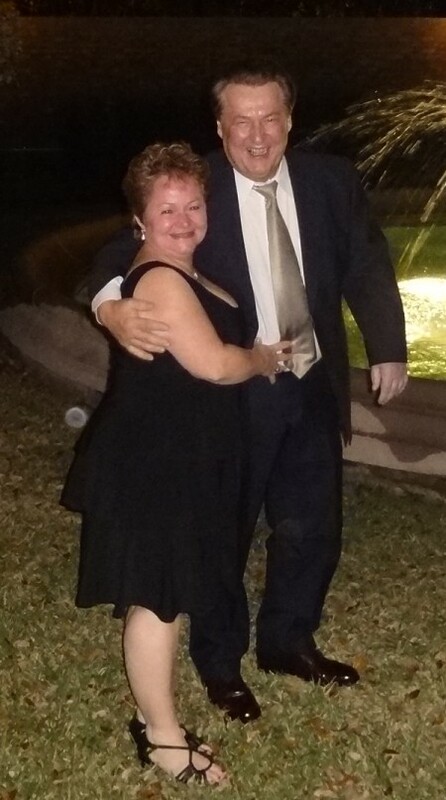 A picture of Rick and Marla dancing together. Thank you so much, Jo Anne Hatley, for sending it to me! 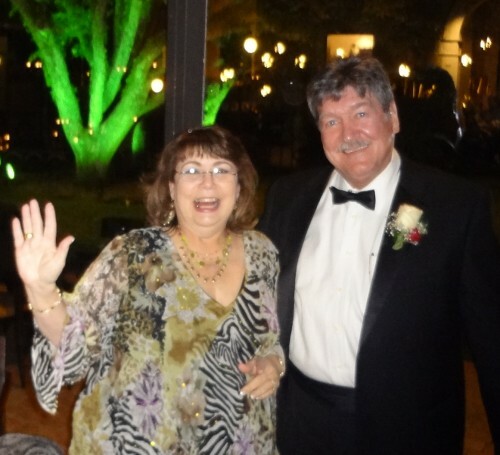 Jo Anne read my story of the Reception. She noticed the spot where I confessed that I had accidentally forgotten to get a picture of Marla and Rick together. Jo Anne must be psychic. Reading between the lines, Jo Anne somehow guessed that Marla was mildly upset. Thank goodness Jo Anne came to my rescue. Not much of a picture for Chris Shields, but I'll make it up to him. Fortunately this is an excellent picture of Daryl Armstrong and our beautiful Liana. She looks pretty good for a Jungle girl. This picture of Mark, Peggy, Iqbal and Barbara helps to convey the richness and beauty of our Reception area. We all felt very fortunate to have this luxurious setting to enjoy Ed and Tracy's Reception. 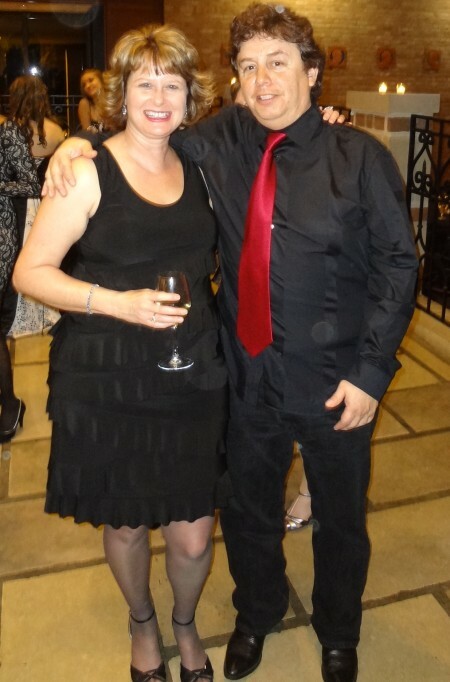 Here we have another picture of Ed and Tracy as they make their appearance at the Reception. Celebrities in the background include Aisha Currie (in blue) with her mother, Caitlin Prescott, and Jo Anne Armstrong. 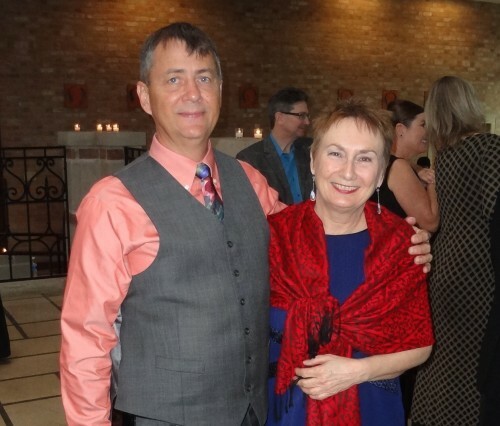 Like many of the people at Ed and Tracy's wedding, Daryl and Jo Anne met at SSQQ. 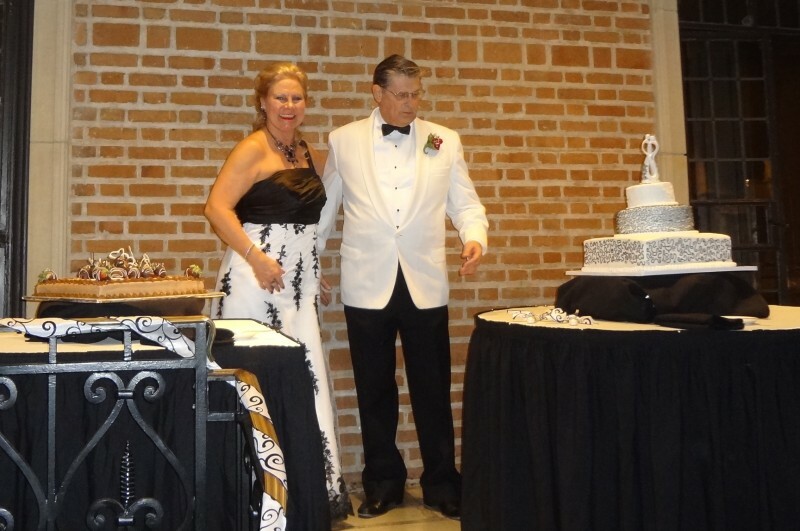 Daryl and Jo Anne were married in October 1998 and held their reception at SSQQ-Bissonnet. A lot of people are unaware that they are an SSQQ wedding couple. One person asked me why their names are not listed on the SSQQ Wedding Hall of Fame list. That is because they got married just a month before the SSQQ web site debuted in November 1998. 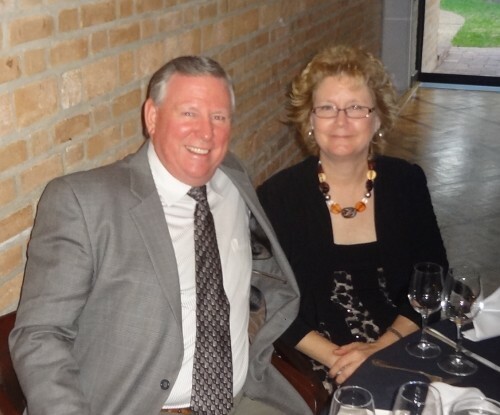 I am very grateful to Daryl and Jo Anne for carrying on the SSQQ tradition. Here is Chris Shields with Karen Eggert. Much better picture of Chris. I do not know the couple on the right, but they were attractive both on and off the dance floor. They had some great dance moves. The lady was quite fetching when she danced freestyle. I told the gentleman he was the best dancer in the room who wasn't from SSQQ. He laughed and said that was easy because everyone else who was dancing came from the studio. I was thrilled to see Conor again. He left America five years ago to work in Iraq during the war years. I have no doubt he has tales to tell. In the meantime, what a pleasure it is to have Conor back here in Houston after his long absence. On the right, we have a blurry picture of Mary Cioffi and Andrew Bach. Their smiles are great, but I must have flinched. So that brings up a philosophical question. If there is only one picture of Mary and Andrew, but it is of poor quality, do you include the picture or omit the picture? What would the deep thinkers of all ages say? What would Plato say? What would Miss Manners say? On the left we have Jeanne Tobin and Aisha Currie. Aisha once worked for SSQQ and was a popular presence around the studio. I understand she is engaged to be married to her long-time boyfriend Greg May. 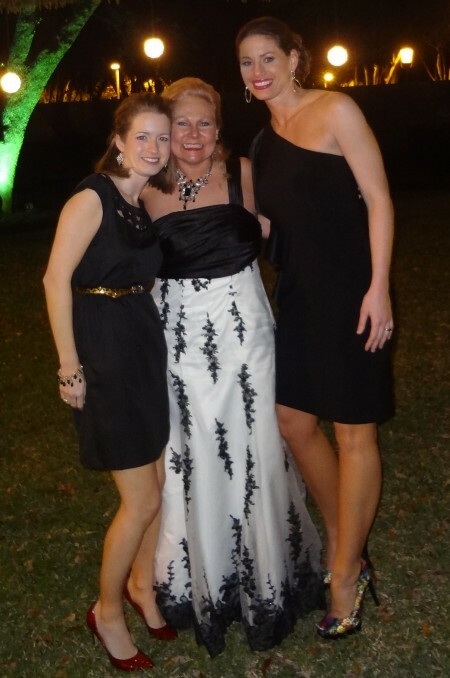 Jeanne was the Wedding Coordinator! Wow. Nice job. I have to tell you, this was quite a Wedding and quite a Reception. 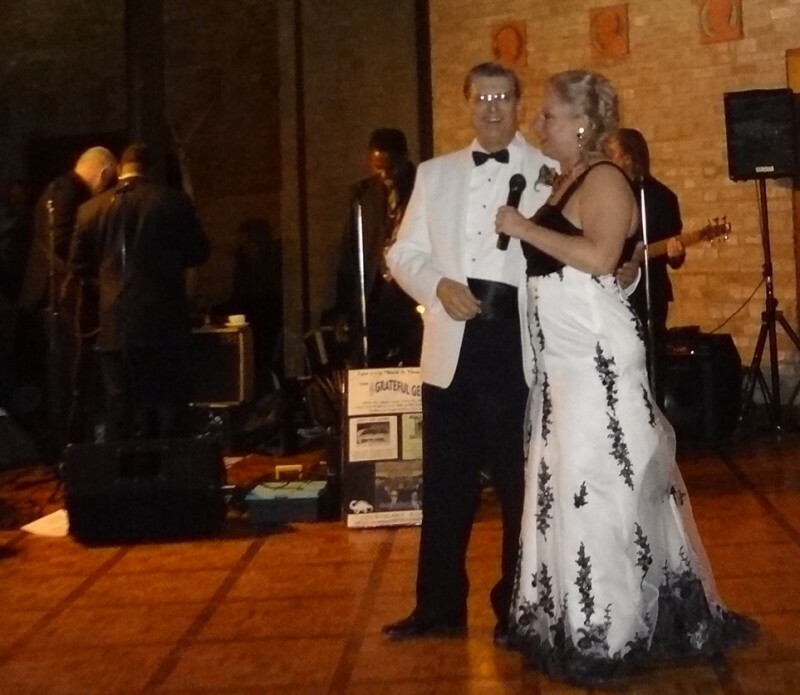 I understand that Jean's son Sean sang vocals at the wedding ceremony. I know Jeanne must be very proud. On the right we have Merry Sherry drinking Merry Sherry alongside the handsome Edward Sanchez. Sherry still holds the record for the most undocumented misbehavior on SSQQ cruise trips. I never catch her at anything, but oh the stories I hear. Interestingly, same thing for Edward. He never gets caught either. Hmm. On the left, we have JA Kirkland, Tracy's handsome son, along with his girlfriend. During the party, I quietly admired the medals this young man was wearing. I got the distinct feeling there's a story there, but I decided this was not the time nor place. Still, I could not help but be grateful for his service. 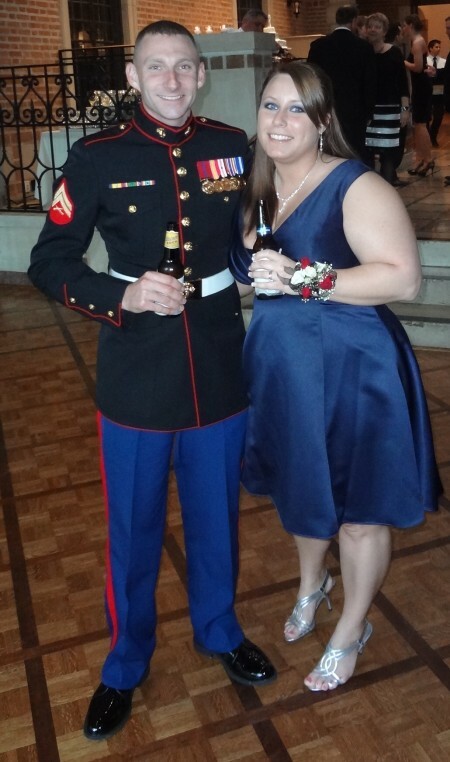 MG is a former Marine, so I have no doubt MG and JA not only only compared initials, but service experiences as well. Tracy's pretty daughter Kayla was also at the Reception, but our paths never crossed. Too bad. I wanted to meet her. 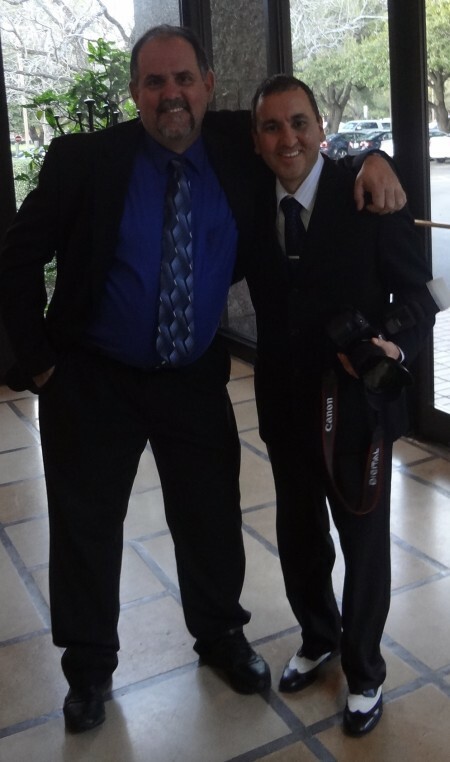 On the right we have two working stiffs. That's Mitch Istre, DJ extraordinaire, and Steve Gabino, photographer extraordinaire. In their spare time, they are also excellent dancers and great guys to get to know. However, today they were here to offer their services to Ed and Tracy. Tracy and Ed are getting ready to cut the cake. 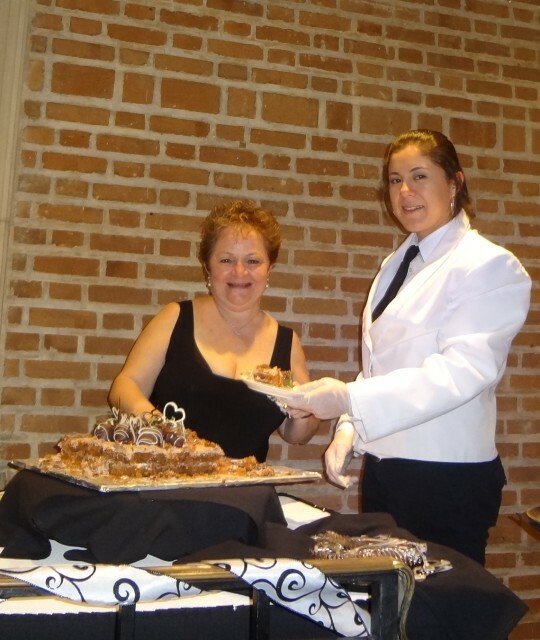 Marsharita was kind enough to lend her considerable talents with two delicious wedding cakes. 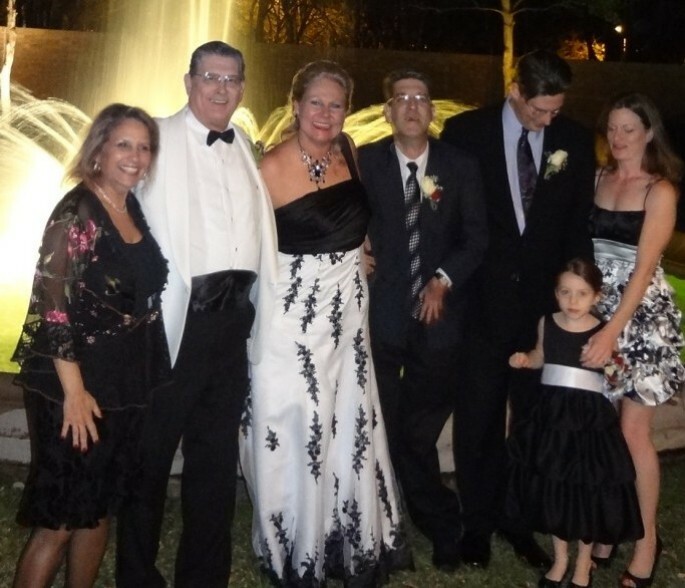 Between Jeannie and MG, Marsharita and Jerry, Mitch and Steve, Manny and Al plus a host of other contributors, this was a true SSQQ family wedding. 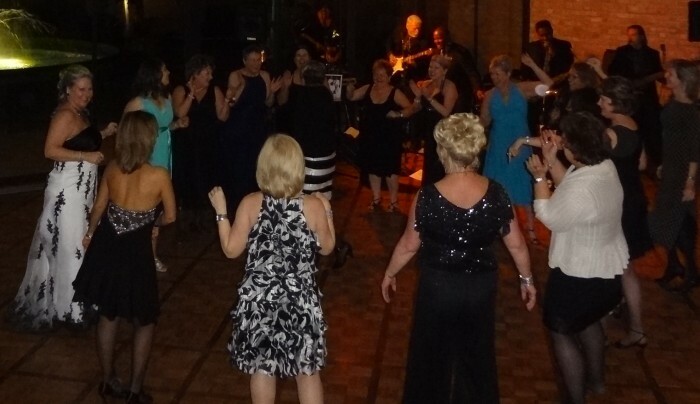 This was a special gathering of friends who have become tightly knit through many shared dance moments and cruise adventures over the years. Many people were kind enough to point out my own role in the gathering. I said just being here was all the reward I needed. I could not have asked for a happier experience seeing all these people in action again. I need to add Marla deserves credit too. Her work with the cruise trips has added a dimension to our group that is greatly appreciated. Now that I think of it, just like a family, we all play important roles. In the midst of all the warmth and energy swirling around me, I had an odd personal experience. The pretty young lady standing next to Marsharita is a Rice student. Her hometown is Monterrey, Mexico. In addition to this young lady, there were a dozen other Rice students working the party. I am not sure how much the other guests noticed these students, but I watched them all carefully. You see, back when I was their age eons ago, I did the same thing as this young lady. I was fortunate to go to Johns Hopkins on a full scholarship. But all that scholarship paid for was tuition. If I wanted to eat, have a place to sleep and buy books, I needed to work. And work I did. I stacked books in the library, I supervised two different reading rooms, and I worked at the Alumni Department helping to prepare for the important phonathon fundraisers. I also worked as a waiter at Alumni gatherings just like this young lady. At one point in the Reception, I pulled her aside and said there was something I wanted to tell her. I told her that back when I was her age, I set a school record for work-study hours. I told her that no matter how tough it was to work and find time to study, it was all worth it. I told her to be patient. This was her time to serve, but someday she would begin her career and her talents would shine. The girl smiled and then to my surprise began to cry a little. As she wiped her tears away, she whispered that coming to Rice was the luckiest thing that ever happened to her. She said if I only knew how hard things were in the place where she had come from. Now she really appreciated knowing that it had worked out for me and that I believed it would work out for her too. I had sent her a "hang in there" message that greatly encouraged her. In addition to the great DJ music played by Mitch, we were treated to the live music of the Grateful Geezers. 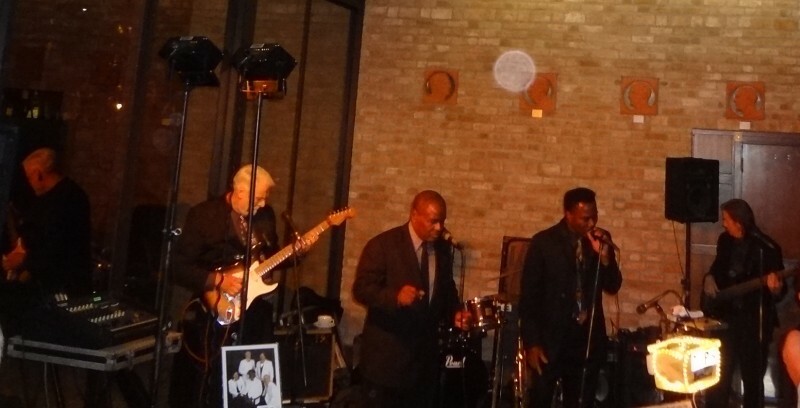 These guys play a lot of Sixties R&B. That is the perfect music for Whip and West Coast. This is my kind of music. I don't know what I did to deserve the cosmic pleasure of having this great dance floor and great dance band at the same time, but I took advantage. Marla and I danced to practically every song they played. We could barely move the next day, but you know what? It was worth it. 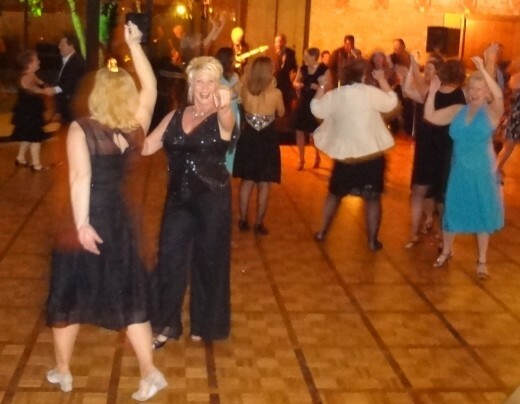 It was wonderful to dance the night away to such a fun dance band. Thank you, Ed. Thank you, Tracy. Thank you, Geezers. Will you pass the Tylenol, Marla Darling? As you can see, I wasn't the only one who magically thought we were young again. The whole crowd danced like they were kids. There's a story here. That's Marla going underneath doing the Limbo. Marla told me later that when they discovered she wasn't struggling like everyone else, someone shouted, "Marla's too good. Everybody lower your arms!!" When I saw this picture, I discovered it was Mona and Vivian who gave Marla the raspberry. They weren't about to let Marla have it easy. When the Geezers played the feminist fight anthem I will Survive, the women went nuts. I am not exaggerating. The girls displayed so much energy and animation while dancing to that particular song, I got a little nervous. I decided to stay back. Judging by the Geezers' expressions, they looked a little worried too. The girls might survive, but would they? This was EXACTLY the kind of song that could make a girl snap. A song like this brings up unwelcome memories and bitterness. A man never knows when he might become collateral damage if a girl goes postal. At any given moment, some kicked on lied to treated like dirt woman might go off and stampede like a wounded elephant. Not that I have been mean to these ladies, but a stampeding elephant doesn't always look before stomping. At these times, any man will do. So I stepped back and took my pictures from a safe distance. Looking at these pictures in review, I conclude I made a wise move. All jokes aside, when it comes to "I Will Survive", we all know no one in this room has endured more heartache than Tracy. It was a thrill to see all those women acknowledge Tracy's triumph over horrendous pain and heartache. Some very deep wounds have been healed. The Ring of Survivors were excited when Ed joined his wife Tracy in the circle. What a transcendent moment it was to see Ed and Tracy celebrate together. In its own way, this moment was just as touching as the Wedding Ceremony itself. It was great climax to a wonderful night. I am going to take a chance and talk about a sensitive topic. Some of you reading this story may not know that long before Tracy ever met Ed Akin, she was once married to another man she met at SSQQ. I am speaking of Gary Schweinle, our beloved Mr. Hat. 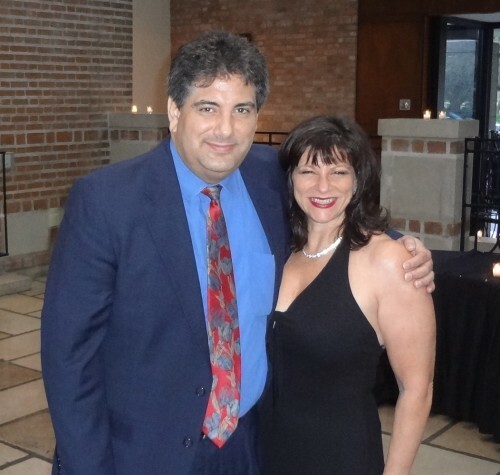 Marla and I had the privilege of attending that wedding too. Marla and I both loved Gary dearly. I am not ashamed to say I still cry thinking about Gary. Gary and Tracy shared their honeymoon with all of us. They went on Marla's August 2008 cruise to Italy. Along for ride were Sherry, Jeannie, and Mary. Mary was nursing a loss of her own and Tracy was helping her heal. Steve, Vivian, and Marsha were also at Gary and Tracy's table. They all shared so much laughter together. It was a special time. Then tragedy struck. 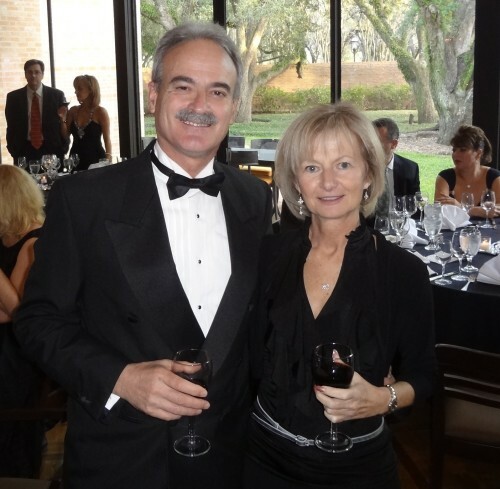 One short month later in September 2008, Tracy lost Gary in a freak accident during Hurricane Ike. Gary was electrocuted while trying to fix a problem on a metal roof. Tracy had just lost her husband of two months. The pain was unimaginable. Filled with grief, Tracy was sent reeling. 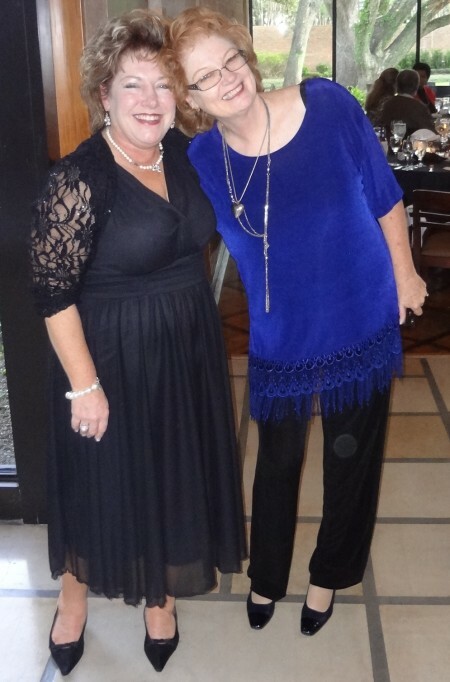 Fortunately Tracy had friends like Jeannie (pictured), Sherry, Mary, and many others to watch over her. Tracy's friends enveloped her in a protective pocket. Many of the women in tonight's Ring of Survivors were the ones who helped Tracy carry on. They kept Tracy alive and functioning when the pain was so unbearable. Back then, the men tried to help too. A perfect example was Leroy Ginzel. Like me, Leroy loved Tracy and Gary. After the tragedy, one day Leroy came out to Gary & Tracy's home. He worked tirelessly with his chainsaw cutting up the dense wood that had fallen in the hurricane. Leroy was in his 70s and had a heart condition. Nevertheless, Leroy would not stop even though we begged him to. Leroy was an inspiration to me that day. 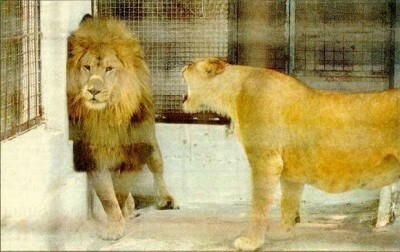 Leroy had only one thought - he wanted to contribute something to lessen Tracy's pain. A lot of us who were at the Reception remember those terrible days because we all shared in the tragedy. That was four long years ago. Tonight we participated in a rebirth. We saw a return to happiness for someone who deserved this second chance as much anyone in the whole world. And what did Tracy do all night? She went around hugging people. She went from one person to the next thanking them for making this such a special night. And I am sure she thanked them for more than just that. Of course that blessing was Tracy's marriage to Ed Akin, the man who restored the joy in her life. These two people were so classy together. I could not help but nod in total appreciation. Tracy and Ed fit together like a velvet glove. Ed and Tracy took the time to thank us all for coming. It just another classy gesture in a night that featured a long line of classy gestures. All I could think of was that this night was one of the most powerful emotional experiences I have ever encountered. These two people reached out and gathered a huge group of people and shared their enormous warmth with us. I am proud to have been given the chance to participate in one of the great Lovefests of my life. I have never felt closer to this tight-knit group of friends. Thank you, Ed. Thank you, Tracy. Thank you not just from me, but from every person who shared in the evening. The two of you gave the party of a lifetime. While you were in the process of becoming one, you helped bring us all closer together in so many wonderful ways. You are quite a couple and we are quite a family. 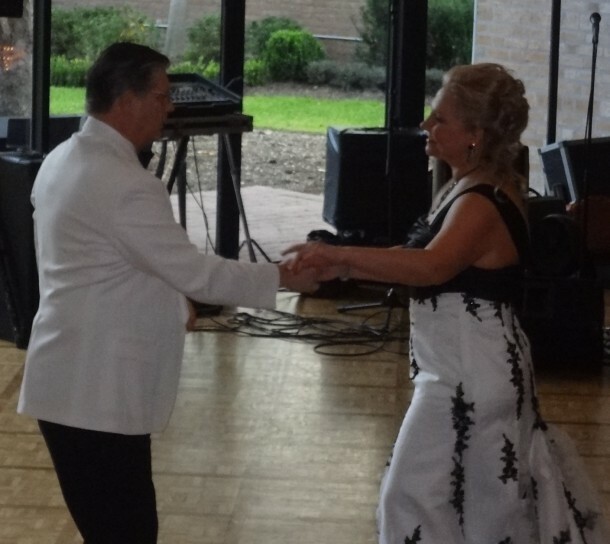 Rick's Note: The story of Tracy Akin is well known to all SSQQ insiders, but there are probably a lot of newcomers to the dance community who don't know the details. Tracy is the woman who fell in love with Gary Schweinle, a rough-hewn cowboy with a heart of gold, back around 2007 over at my old studio, SSQQ-Bissonnet. Their July 2008 Wedding brought tears of joy to all the many friends of this couple. One month later, Marla and I watched with great satisfaction as Gary and Tracy embarked on their honeymoon on our 2008 Cruise to Rome. This was the happiest couple we had ever seen. One month later, Gary was dead. We were absolutely shocked out of our minds. The poor man was electrocuted in a freak accident. As the whipping winds of Hurricane Ike approached in September, Gary climbed on his metal roof to better secure loose metal strips. His electric drill drove in a screw that nicked a utility line. That electrified the roof and electrocuted Gary when he grabbed an antenna to steady himself in a gust of wind. Tracy was downstairs. She heard a horrible shriek from above followed by a thud on the ground. She ran in horror to Gary's body. Despite her medical training, Tracy was helpless to do anything. Gary died in her arms. To this day, Gary's death remains the greatest tragedy in the history of our SSQQ Community. I have to say that Tracy's friends at SSQQ basically kept her going. Without them, Tracy's descent to the abyss would have been complete. Even with their help, the pain this poor woman suffered was nearly unbearable. Slowly but surely, Tracy was able to pull her life back together. Then, as if by miracle, a couple years after the tragedy, Tracy found a new love. Ed Akin was a handsome, kind, intelligent Rice professor. Every single one of Tracy's friends were thrilled for her. Tracy had been given a second chance at happiness. 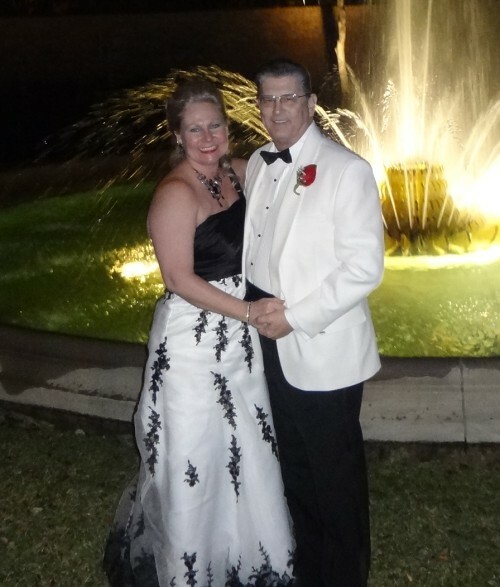 Ed and Tracy were married in a lovely ceremony over at Rice University back in February. I wrote a story about the event (Ed and Tracy's Wedding) that captured the warmth and respect we all feel for both Ed and Tracy. In the story, I took the risk of mentioning our fondness for Gary as well. This was potentially a very painful subject, but I have always loved Gary and wanted very much to say his name again because he was such a wonderful guy. There is no way around it. As we approach the four year mark of the 11 September 2008 tragedy, any mention of Gary still brings pain to many hearts even to this day. Shortly after I published my story, Tracy wrote me a beautiful letter thanking me. Not only did she support my inclusion of Gary into the story, she also took the time to explain why her "guest list" had excluded so many dear friends. I loved the letter so much that I wanted to publish it� but did not dare do so without asking Tracy's permission first. I never heard back from her. I assumed her lack of reply meant 'no', so I didn't bring the subject up again. Then out of the blue, a couple days ago I got a letter from Tracy. Read for yourself. Of Course You Can Print my Letter!! Oh my gosh Rick�..I am soooooo sorry I didn't see your request to publish my letter till today! We got a new computer the end of March, and I thought all my emails were lost, and here they are! I just found them tonight�.all 1700 of them, so I was going thru and deleting stuff�.and I came across your email. I am totally trying to learn a Mac�.and I have only used to Windows�so I feel like I am a blooming idiot! Of course you can share my letter! Anything that I write to you I consider public domain, unless I tell you otherwise�.�.but I don't mind if you don't. Since it's so long after the wedding�.We could say I was happy to have reached my 6 month wedding anniversary, and was writing to you now. I was very anxious about anniversaries with Ed. When Ed and I had our 2nd month anniversary, I told Ed, that we had made it as far as Gary and I had, and he looked really shocked�.and said�. "that really puts things in perspective. That was too short a time to have been married, and then to lose him ." He (Ed) really gets me, and totally understands how hard that time was for me. But I am still able to enjoy each month's anniversary with him�..and he gets that too! We just celebrated #6!!!! Ed won't mind anything that I have written. You may use any or all of it as you see fit. I trust you and Marla, and always will. I know who my friends are, and you two are at the top of my list. I just wish I had seen your request earlier. I don't think it's too late, and yes, if it will help all those people that didn't get an invite to understand � hopefully� I think it's a good idea. Plus, if you don't feel it's too late�.it might help anyone in the future to make sure they get their wedding reception papers back quick, so they don't have to go thru what we went thru! Ha. Again, I am so sorry I didn't see this. If that happens again�.just call me! You must have thought I was such a dolt not replying back. If you want to write anything concerning this and that email, go ahead! I am sure that you will do a splendid job!!! P.S. By the way�.the crazy lawsuit against me by Gary's girls has been postponed until December. Can you believe it?? We will keep you posted! Rick's Note: Now that I officially have permission, I would like to share the lovely letter Tracy wrote after her wedding and honeymoon from six months ago. I think you will enjoy it; it is a very interesting story. In fact, Tracy's story is so crazy, it reminds me of my own wedding fiasco back in 2004. I am glad to see I am not the only one who has to suffer the 12 Labors of Hercules just to get married. Thank you so very much for the absolutely splendid write-up about our wedding. Wow!!!! I was so blown away by all the pictures, and the wonderful story! Ed and I were able to share them with our families, even before we got the wedding pictures back! You might have noticed that our only family members in attendance were our kids. My sisters all have kids in school.....so it was hard for them to try and schedule a wedding right before spring break. I don't know if you heard....but this wedding almost didn't happen. (well, I mean we were always going to get married....but we had a major snag close to the date.) On the Friday before Christmas, at about 12:30 pm, Ed called to tell me that "he had bad news". Turns out the place we had scheduled our wedding/reception had been overbooked!!!! Ed explained the owner had acknowledged his mistake, and had called the other party, and their response was that they had already sent out invitations. We were just about to send out ours...and since he knew we hadn't sent out ours....he said he was giving it to the second party. Talk about ruining your holiday season! When we protested, the gentleman quit taking Ed's phone calls, and then stopped taking Ed's lawyers calls. Since he acknowledged that it was his mistake, we were trying everything from re-booking, to perhaps changing to a day before or after....but by then the communication was broken down...and now it is January 3rd. My son was not able to change his orders for any other time but what we had planned....and those of you who have someone in the military know, you don't get orders changed. So we were getting married that Saturday come hell or high water, but the ceremony might have to be in a tent in my back yard. Our lawyer gave us the go ahead to find another venue. I was very worried....what if this guy said at the last minute....okay, you can have your event here....what kind of service would we get since we forced his hand? Then on the other hand, I am thinking....where are we going to find another location for a wedding in 5 weeks, and on Valentine's day weekend at that?! Then, to add insult to injury, I lost my florist, as her mother died, and she was going back to the Philippines and probably wouldn't return for a few weeks. We called, and called, all sorts of places....with no luck. Ed went back to one of our original sites....the Rice faculty club...At the time we were doing all the planning, it was already booked. A miracle happened - the faculty club at Rice had a cancellation! What a relief.....now to find a florist. I called everywhere, and was turned down because it was Valentine's Day weekend....and they couldn't possibly fit it in. Sooooo, I decided to go to the florist by my house that had already turned me down....and plead my case. Luckily, when I walked in there, the owner was there, took pity on me, and agreed to do the wedding. That was 2 weeks before the wedding. Now, the third and final problem. The venue we were getting was half the size of the original site. That meant we had to cut the guest list in half! To me, that was the biggest, most egregious last straw ever!!! I agonized for days and nights whom to invite, and who we would reluctantly leave off the list. This was the most horrible thing in the world for me to do, because all of the SSQQ people are family to me! We finally decided, to be fair, that we would each make a list of people, then compare lists, and the people who were on both of our lists would be invited. I was at a distinct disadvantage, because I know a lot more SSQQ people than Ed does. I think that some people were very hurt that they couldn't be invited. I heard that everyone was buzzing about the wedding, and then finding out that they weren't invited, when others were. I just hope and pray that the ones that were not, do not feel slighted, and understand what we were dealing with at the time. That's why I was so glad to see all the pictures, and the great write up. That fact it was in the news letter made it even better. Everyone that couldn't be there, could read about it, and almost feel like they were there. Rick, I loved your whole story....every bit of it! So did Ed!!! I was glad that you weren't afraid to address my SSQQ history in the story, and mention my "Mr. Hat" Gary. Looking back at that horrible time in my life, I realize the reason I made it thru, was because of my SSQQ family. Gary knew I would be alright because of all the wonderful people that were our friends, and still are my friends, and now friends of Ed's as well. We all miss Gary!!!! Gary touched so many lives. It wouldn't be right if we didn't mention him. Because of Gary's love, I knew that he would be pleased with all of us, for moving forward, towards happiness again. Gary always was saying...."life is for the living." Gary would be thankful that there are so many people to help me pick up the pieces...and move on. He would be very pleased with my new husband. 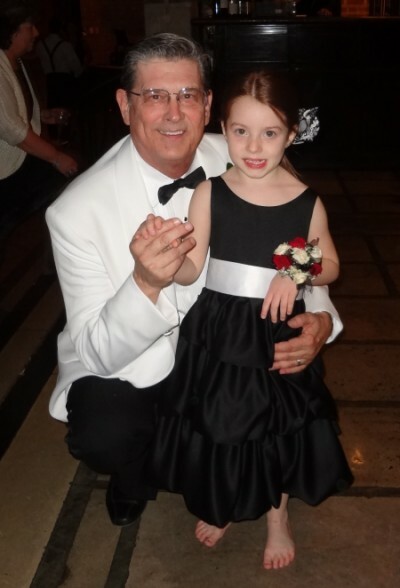 Remember, he always called you and Marla the "Godfather and Godmother" of the SSQQ family. 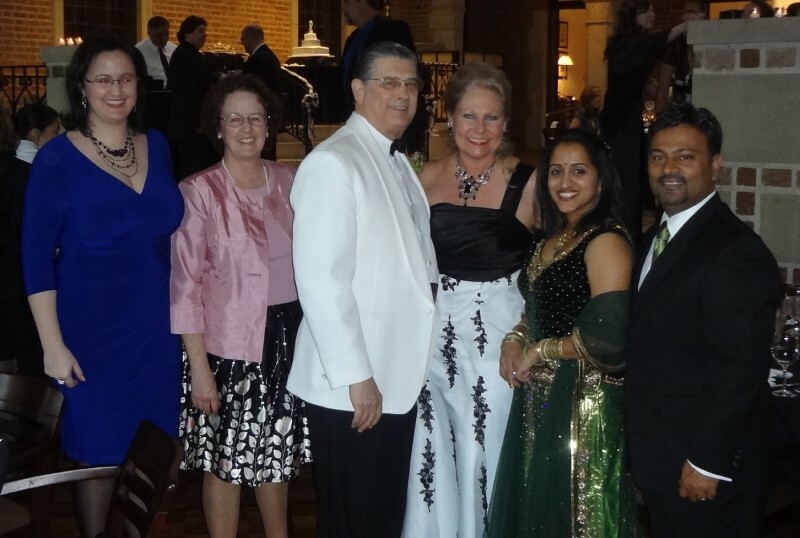 He would have been very pleased with all the love and laughter we shared with "our family" at the wedding. And he would be very pleased about the write up about Ed's and mine wedding. 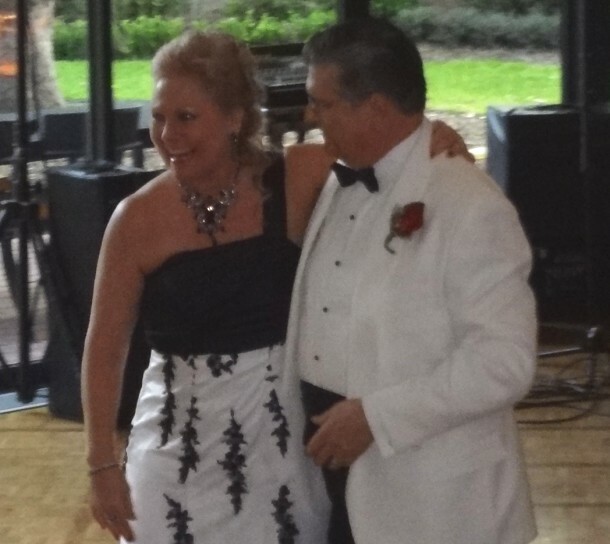 Ed and I are looking forward to many more years of fun with our "Godparent's" and dancing family. You guys are the Best!!! !